In today's globalized world, religious diversity has become one of the strongest challenges to the self-understanding of any major religious tradition, provoking two interdependent questions. How does it see itself in the light of others? And, how does it see others in the light of its own teachings? While the Abrahamic religions are often accused of a predominantly intolerant and exclusivistic attitude to the religious `other', Eastern religions-and Buddhism in particular-enjoy the reputation of being naturally tolerant, absorbing, and even pluralistic towards competing faiths. Some thinkers (from David Hume to Jan Assmann) understood religious intolerance as an inevitable property of monotheism, supposedly absent in the case of non-theistic or polytheistic religions. More recent research, however, has suggested that this impression, part of a whole cluster of Western cliches, is false. Buddhism is-and has been-as much convinced of its own superiority as any other faith, and has also been involved in various inter-religious tensions and violent conflicts. The ways, however, in which Buddhists have thought about the religious `other', and practically dealt with it, display peculiar features, which do indeed differ profoundly from what we find in the Abrahamic faiths. Yet today, Buddhism must address the question whether it can arrive at a genuine appreciation of religious diversity, and recognize other religions as different but nevertheless equally valid. This new four-volume collection from Routledge's acclaimed Critical Concepts in Religious Studies series enables users to make sense of this and other dizzying questions. It brings together the best thinking on Buddhism's relationship with other faiths and provides a one-stop collection of classic and contemporary contributions to facilitate ready access to the most influential and important scholarship. 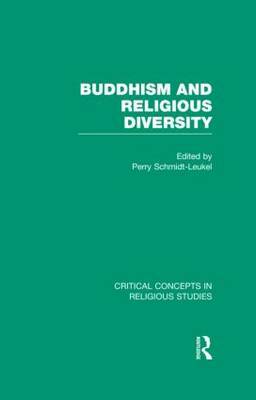 Fully indexed and with a general and volume introductions, newly written by the editor, which carefully locate the collected materials in their historical and intellectual context, Buddhism and Religious Diversity is an essential work of reference. It is destined to be valued by specialists and scholars working in related areas as a vital research tool.